Emily Myers studied ceramics at Bristol Polytechnic and Camberwell School of Art, and has been a full-time potter since 1988. She moved from her workshop in London and now pots in rural Hampshire. Influences on her work include metal objects and machine components such as nail heads, screws and metal piping produced in industrial processes. Architectural forms are also a source of inspiration. This piece has the precision look of a machine-made object and is assembled from components that have been squeezed out in a ceramic extruder. The glaze shades from a deep turquoise to a pale grey-green pooling in the middle sometimes matt, sometimes shiny. 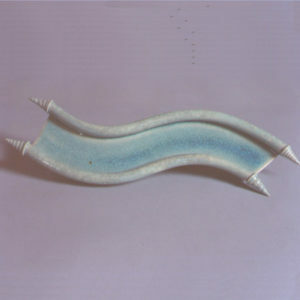 It is an abstract ceramic form with no apparent function but its fluid shape might suggest other things from garden paths to water slides.